Piece Rate system is widely used when it comes for calculating payment for the garment factory workers for their work. Piece rate can be defined as how much money (dollar) to be paid to a worker or group of workers for making one garment. Piece rate may be measured for one complete garment or individual operations. Piece rate can be also explained in term of output. In a Practitioner Briefing, M.L. Phan explained Piece Rate as following. The garment industry in Asia compensates factory workers daily based on what they produce, so piece rate (the number of man-hours it takes to make a single garment) is the standard measure of output. Piece rate also is used in price negotiations between producers and buyers because it avoids the necessity to adjust for currency fluctuations and conversions. The number of cumulative man-hours it takes individual operators to produce a single piece of clothing. It disregards quality, i.e., whether or not the garment is saleable. The number of man-hours it takes a team to collectively produce a single piece of clothing that meets quality standards and is saleable. 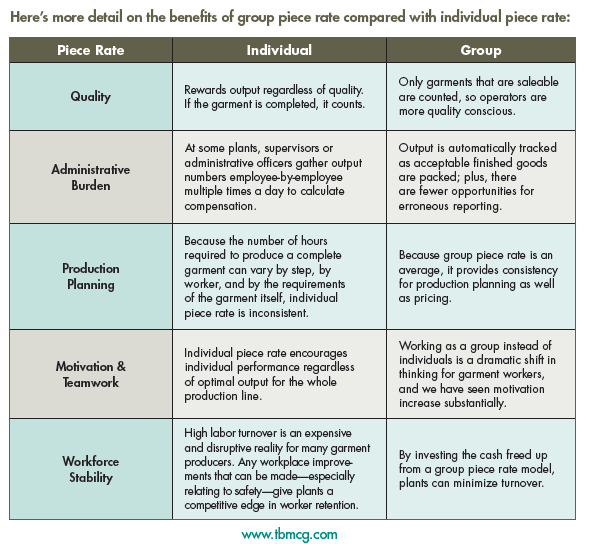 When it comes for use what are the benefits of the Group Piece Rate system over Individual Piece Rate system? Read the comparison on the following table. Also Read: Which payment system is better for sewing operators in garment manufacturing - Piece Rate or Salary based?